What a great way to start this year’s festivies! For springten‘s opening concert last night, Moderat performed a spectacular audio-visual show in a magical setting on top of a hill that overlooks the whole city of Graz. Beautiful music and gorgeous visuals by Pfadfinderei. 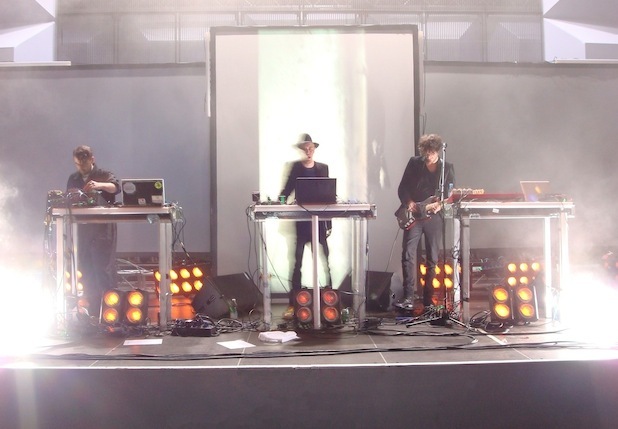 Moderat is an electronic music project that started in the early 2000s in Berlin as a collaboration between Sascha Ring (aka Apparat), Gernot Bronsert and Sebastian Szary (aka Modeselektor). Their first full-length album took a long time to complete, due to some creative disagreements and different opinions on how they should work. It was finally released in 2009 – seven years after their debut EP! However, the final result is outstanding! With their debut album Moderat managed to please almost everybody and recevied rave reviews. Fully dedicated to the exploration of current dance music trends, they have put together an album that is eclectic and sophisticated but still retains a strong pop appeal.